International soccer star Cristiano Ronaldo of Portugal said the Iceland soccer team at the UEFA Euro 2016 tournament was "not going to do anything." His comments came after Iceland tied Ronaldo's Portuguese team 1-1 in the first week of the tournament. Then Iceland tied Hungary. Then, it beat Austria. And Iceland advanced to the elimination rounds of the tournament. Few expected Iceland to make it that far. American comedian and television show host Stephen Colbert enjoyed the Icelandic announcer as he reacted to the game-winning goal against Austria. The announcer screamed, as if he could not believe what had happened. Colbert talked about the announcer's excitement on his late-night television show. He joked that his show's TV network, CBS, might want to consider hiring that announcer to add excitement to its sports programs. Iceland faced mighty England on Monday. No one gave the team from Iceland a chance to beat England. After all, only a few players on the team are well-known outside of Iceland. England has players from famous teams like Liverpool, Manchester United, Arsenal, Chelsea and Manchester City. 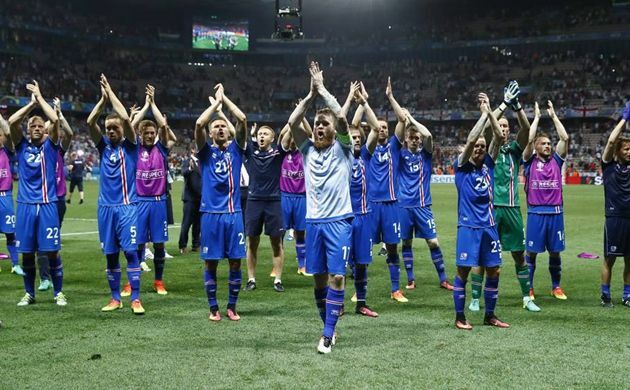 But on Monday, Iceland continued its unbelievable journey. Behind goals from Ragnar Sigurdsson and Kolbeinn Sigthorsson, Iceland defeated England, 2-1. And soccer fans around the world are still reacting to Iceland's "Cinderella story." The phrase refers to the famous story of Cinderella. In the fairy tale, Cinderella is the overlooked beauty who catches the eye of the prince at a big party. In sports, the phrase is used for teams that unexpectedly win at major events. Before the game against England, Iceland had never won an elimination game at a major international tournament. Ahead of the tournament, England's team was ranked 11th in the world. Iceland was ranked 34th. Iceland may be in the middle of a soccer revolution, says Vice Sports. The country has invested money in the sport in recent years. It has built more large buildings where teams can play soccer indoors. This is important in a place like Iceland, where the weather sometimes makes it impossible to play outdoors. Before the tournament, Iceland was not seen as a contender for the European championship. One writer put together a silly explanation of how the team from Iceland was chosen. She said the team was made up of 23 men who had nothing better to do in June and July. But soccer fans now respect the team from Iceland. Many viewers enjoyed the way the players gathered to celebrate with their fans. They stood together, raised their hands above their heads, and clapped slowly before ending with a loud cheer. Iceland's players look like they have found a way to win, playing good defense and waiting for opportunities to attack. But they will be tested again on Sunday against the tournament's host nation, France. Once again, many people think it will be difficult for Iceland to win against a team filled with international superstars. But after the win against England, anything seems possible. Iceland's team manager said "now... every obstacle in their way is going to look smaller." And that's What's Trending Today. The children hung about their mother, hoping to hear a fairy tale. The beginning of libraries came after the end of the prehistoric era. It looks as if it had set in for a wet day. She sang an old well-known song. 1.The phrase refers to the famous story of Cinderella. His statement refers to people in general, not to anyone in particular. Revaluation refers to fixed exchange rates. 2.Before the tournament, Iceland was not seen as a contender for the European championship. The reform may be seen as temporary rather than permanent. The government's announcement is seen as a move towards settling the strike.